Two popular sites that, help authors and blog publishers find one another, are www.textbroker.com and writeraccess.com. Here are some details of each site. The textbroker sites states that the site is for unique and exclusively written articles that are written to the client’s requests. They pay fixed rates that ensure easy planning for budgeting. They say that they have a large list of authors, who are knowledgeable about many subjects. The site states that their authors aren’t required to already be professional authors, but their better writers earn more money. The site has a section for clients to sign up and a section for authors to sign up. The section for clients states that they have thousands of authors who want to write articles, blog posts, and reviews, for reasonable prices. The section, for authors, states that proper spelling and grammar are required. It states that the authors can use, for free, the Textbroker WordPress Plug-In, to help the authors post their articles. Writersaccess.com states that it has sold more than 260,000 articles to more than 3,000 clients. That site states that it uses Copyscape originality verification and new technology to make the approval process easy. Unlike textbroker, the writersaccess site gives more details about their pricing. It states that a client can start by making a $50 deposit that’s 100% applied to the client’s first order. The writersaccess site also states that a client may choose a pricing plan. A client may choose to pay a certain cost per word and choose a star rating, for an author. A higher-rated author is paid more. A client may choose to pay a fixed-rate that is nogotiated with the author. Both of these sites can be useful for authors and webmasters who want to pay for articles. Both of those groups can benefit from one of these sites or both of them. If someone considers conducting business with these companies, he or she should read all of the details, on both sites, to find which one is better for that person. The first commercial jingle was used in a 1926 General Mills cereal radio commercial that included an a cappella quartet. Ad jingles become more popular in the 1930s, and they later become an important part of TV advertising. For at least 50 years, millions of people, throughout the world, especially the U.S., have heard radio and TV commercials that have songs. Some of the songs are easy to remember and help people remember the products. In 2011, the University of Basque Country, in Spain, conducted a survey, about music, in ads, and the researchers found that people had different reactions, depending upon who announced the product and the type of music that was used. The researchers used jazz, swing, and classical music. The survey included 540 people, ages 15-65. The ads mentioned a fictitious brand of mineral water. The survey included four ads. One didn’t have music. Two had music that wasn’t familiar to the listeners. The other ad used an instrumental version of “What a Wonderful World,” by Louis Armstrong. The majority of the subjects had the highest emotional response to the ad that included “What a Wonderful World,” but they had the lowest response to the ad that only included talking and no music. McDonald’s has had some of the catchiest commercial songs, including “You Deserve a Break Today,” “We Do It All for You,” and “Good Times, Great Taste.” For a few years, they’ve been using “I’m Loving It,” which is catchy, for many people. In the 1970’s, Coca-Cola had a popular commercial song, “I’d like to Buy the World a Coke,” by the New Seekers. Many people called radio stations and requested the song. The New Seekers recorded a longer version, for a record, “I’d Like to Teach the World to Sing.” Both songs were popular, in the Billboard charts. Many companies know that songs, in their ads will help people remember the ads and the products, so the companies try to air ads that include unforgettable songs. Mobile Website: Nearly everyone has a smart phone these days, and many people spend more time on their smart phones, as they’re on the go, than they do in front of their computer. So consider developing a mobile website in addition to your regular one. This way, it’s easier for people to navigate your site from the small screens of their phones and tablets, without having to zoom in on small wording, which could be a turn off to your services. App: Piggybacking off the previous point, many people have smart phones, so consider developing a mobile app that your customers and clients can download to stay up to speed with everything your site has to offer. Considering including special features on your mobile app that they can’t get by accessing the website as a further means of enticing them to download your app. Log In: To get an accurate estimate of exactly who is checking out your website, consider making people log in, or share simple information about them selves before they can access your site. This can be a turn off for some people, but if your site is good enough and worth checking out, people will still come and won’t mind revealing some of their information to log on. This could also be a great way to increase revenue with your website by selling advertising based on the types of readers that are visiting your site. Members Only: Similar to logging on, consider developing your website so that you have to be a registered member in order to access certain content. Again, doing so allows you to gauge just how many people and what types of people are checking out your site, which gives you a better idea of what markets to go after. Membership can be free or paid, though if it’s paid, there needs to be a good incentive for doing so. Free: Why pay for something that you can get elsewhere for free? Consider that question when developing your site, because chances are if you’re charging people to access certain content on your website, they’re just going to go somewhere else where it’s either free to access the same content, or cheaper to do so. Keeping content cost-free will help keep customers coming back. Note: You can still require people to log in to your site or become members without charging them a cost. Social Media Integration: Everybody is on Facebook and Twitter these days, so make sure that your site integrates with such social media platforms. Consider developing your site so that it can be accessed via Facebook and so that people can opt to share certain content on your site via Facebook simply and easily. The additional exposure and ease could help you get more business leads. Easy to Navigate: This one is self-explanatory. If people aren’t able to easily find what they’re looking for, they’re going to look elsewhere for it. Videos: Engaging content is key to a good website. And one way to spice up what’s on a website is by adding different things than just text. Videos are an example of things that developers can embed in websites and allow people a different way to attain valuable information. Attractive: Develop the website to be naturally engaging. This means making it stand out. Don’t strive to make your website appear bland and boring. Add in colorful graphics, pictures, special text and other things that separate your website from your competition. This will help build up a clientele and help your website gain credibility. Just think, when people recognize your brand by “the guys with cool website,” it’s a good thing. User-Centric: Perhaps the most important aspect of your website is making it user-friendly. In other words, you don’t want potential clients to feel like it’s a chore being on your website – you want to give them more than that, so you’re creating a fun virtual environment. If your website isn’t user friendly, you’ll lose business. People don’t want to waste their time on something difficult; they want an easy, user friendly experience. A is for asocialsearch.com is a great place to sign up for 7 of the most popular social media. B. is for Blogging a great place to start writing your own blog. C. is for Chatter from Salesforce.com if you use salesforce.com don’t miss out on this tool. D is for Digg a place to share social book marks. E is for Eventbright a place to sell tickets to your events with very easy sharing options! F is for Facebook if you don’t know what this I am not sure how you found your way to this article. Foursquare if you don’t know what this is it means your over the age of 20 and unless you own a business where you want people to frequent you probably don’t ever need to know what this is.Flicker a photo sharing website. Flixel a photo app that is only available on the Iphone that allows you to make really cool moving photo’s. G is for Google Plus This is Googles attempt to compete with Facebook Grub Hub This is a really cool way if you prefer faxes for a restaurant to take orders online. H is for Hoot suite a tool for companies that want to manage more than just twitter and want to just manage some of there social media. or hubspot is a tool for more a website and social media is a company looking to help mostly enterprise level companies with there social networks and websites. Hi5 a very my space like site that some teeny boppers have taken to we will see if it lasts? or HotSpot a great site to find a free hotspot near you. I is for I tunes for digital audio and other digital media. I care this is the paypal of .orgs or a donation paypal. I pod is a great audio and video player now for less than 125.00 Iphone still the best phone on the market if you are drinking the Apple Koolaid. J is for Jigsy The super easy website builder. or Jeteye better bookmarking for web users. joe shopping a great little coupon site. K is for Knowem a way to find out if your social media name is taken across many networks before going to sign up for all of the other ones. L is for Linkedin a professional social media. M is for Meet up is a social media for meeting up with others of similar interests and hobbies great for both business and people trying to get out and meet more people. My Space even if it is dead (Tom wont mind). meboxmedia.com is a media player for imbedding in your website like youtube except way more interactive and more set up for SEO. N is for Ning is for creating your own social network for small groups that only want to share with each other in a real confidential way. O is for Oyax is a social book marking manager. P is for PinIntrest Social media just for sharing photo’s pining them to a board that you share with people who follow you. Q is for QIK a phone app that allows you to do video conferencing on your phone. http://qubrit.com/ another linkedin.com type of professional network. R is for Reddit a website to share your favorite readings. S is for Slideshare a power point presentation. Website for sharing presentations. T is for Twitter the number one 140 character social media . ( also the only company to be more than a billion dollars in debt and still taking on new investors. twitxr a platform to share your pictures on twitter. U is for ustream A Streaming video cast area for shows online. V is for vimeo A Video social media site. W is for wordpress The number one blogging platform and also the number one SEO’ed websites in the world. weebly.com another place to get a simple website built for you. writteraccess.com a place you can get your content written for you. X is for xanga another Blogging social platform. Y is for YouTube The number one video search engine Yelp the yellow pages of business reviews. Z is for Zillow a real estate price mapping company. We found about 10 advantages of the time line. The new format has a page that is divided into two main columns. The right section shows the passage of time. This format allows companies new options. They can outline their companies’ history with important events, including product launches, and store openings. The new time line allows three tab panels to be viewable, at the top of the page. These replaced the left-side panel of links. Companies can change the above-fold tab apps, according to the latest company news and objectives. The time line allows people to “pin” some posts, on the top of the time line. If a user pins a post, by placing an orange flag next to it, that post will remain at the top of the page for a week or until that user unpins it. That will allow a person or company to remind people about important news. All of the time that a post is pinned, that post will be seen by many people, since it will be the first post that people read, when they view that page. The timeline replaces the old tab configuration, including the 520-pixel width and replaces with a new 810-pixel layout. The new content appears to be more centered, in the middle of the page, without any adjustments. The most important updates, for companies, will be to update the pictures and tabs of the above-fold two apps. The timeline allows a company to send and receive private messages with other users. This allows better interaction, since potential customers can send emails to companies and receive personalized responses, instead of posting questions and answers, in wall-to-wall comments. This allows a happy potential customer, since they receive personalized responses from the company. This also allows a clean timeline. The timeline uses a new cover photo. Users may choose a photo or several. The cover photo is large, like a banner. Each business may use its logo and/or a list of important events, including recent product launches and/or upcoming events. The timeline includes new admin. controls and admin. panel. That panel includes messages, notifications, and insights, in the same location. With notifications, a user has the chance to respond to people who sent messages and viewed that user’s most recent posts. The timeline allows fan page owners to have the ability of signing five levels of admin., according to the owner’s job duties. Each administrator will gain access to different features. The features, for each administrator, is customized, depending upon his or her job duties. The timeline has maps that show the user’s city. If a user gives information for “Lives in” and “Is from,” the timeline shows two maps, showing where each city is. This can be useful, if a someone views a profile and wants to know where that profile owner’s city is. Every small business should take a close look at Social Media and put it into effect. Why you might ask? Because Social Media is used by millions of people, it is where people get information and tell others about everyday stuff. Using each type of Social Media platform effectively will help spread the word about your business to those living in your area. It is very useful for business in suburban areas of major cities such as, Chicago, New York, or LA. So how can each of these help you? Lets find out. Twitter isn’t just for individuals to connect with people around the world sharing news, photos, and everyday, sometimes mundane activities. It is also an excellent forum for businesses to attract customers and is especially good for those with tight budgets. Be careful not to be spammy, twitter users are savvy and it will only make you look bad. Instead, work on creating a friendly, customer focused vision. Start conversations by asking about subjects that relate to the area your business is in. Have contests. A lot of small businesses are attracting lots of twitter followers, thus spreading the word about themselves by having giveaways when they reach follower milestones. Use twitter provide customer support. Pinterest is the latest Social Media platform to really take-off. The key is to pin photos that are visually attractive. Don’t pin photos that are depressing or poor quality. Find photos that relate to your business and where it is based. For example, if you’re an interior designer in Chicago, find photos of beautiful interiors located in Chicago. Amongst what you pin include some of your work, so more people become aware of who you are. The main thing to be aware of is the legal problems they have had with copy write infringement. On Facebook set up a business ‘Fan’ page. Make sure you provide as much information about your business here as possible such as, address, contact details, and what you do. Like Twitter, use Facebook to connect with people located in your city, encourage discussions and answer questions. Use Facebook to list special offers or sales. Also use Twitter to direct people to your Facebook page; telling them that is where they’ll find info about deals. Like Facebook, Google+ lets you connect with customers, but it has more tools. You can group your followers into circles, separating customers from business contacts. This means that you can share the information you want with the people it is most relevant too. Google+ also lets you communicate with customers live on video. If people like what you have to offer they can give it a +1, which will share your business with their connections. 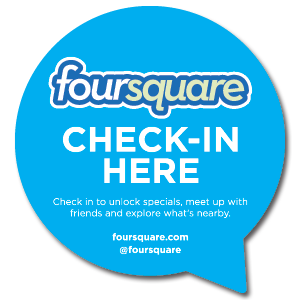 Foursquare is great for businesses where customers come to you such as restaurants, book shops, hair salons, and spas. Every time someone uses the tool to say that they are at your location that is being shared with their friends on their social networks. It is a great way to create customer loyalty and by having a presence on Foursquare you are letting those that use the tool know that you care about them. The Harvard Business Review recently said that 91-percent of businesses do very little or nothing to keep the customers they already have. Making your mark where customers are will help you stand out. Recently, Foursquare set up a section just for businesses which allows you to promote your services in its tool. and gives you useful statistics. Meetup lets you set up a group for your community. For example, if you are located in a western suburb of Chicago then set up a group for there. You can use your group to organize real world meet up’s such as, a special event at your restaurant or shop. Always use your Social Media platforms to let your customers know about what other Social Media you use. They each have different uses and your customers may have different connections on each one, helping to spread the word about your business. If setting Social Media is daunting and you don’t know where to start, you can find professional help. One Chicago based company, Archway Internet Marketing specializes in helping businesses with using Social Media to market their services. Many Facebook changes are often met with hesitancy and resistance among users. Despite some opposition to the new design, Timeline is here to stay and all business pages go live in a few short weeks at the end of March. Timeline is the new overhaul of Facebook’s user profiles that has now rolled out for business fan pages. The new look and feel offers many advantages, but you may need to re-think your design strategy as you go through the upgrade. New design tactics are now needed in place of the old ones and the challenges are to be even more attractive to your fans, to immerse and captivate their attention and encourage them to consume and share your content. The new cover image feature has a lot more potential to generate a strong visual impact, so a design for a strong consistent image or a plan for rotating cover images will help you prepare to look your best, make that critical first impression and keep fans intrigued and coming back to your page. Understanding what’s most meaningful to your target market will help with the new Timeline’s reduction in tab visibility and as well the disappearance of the default landing page. The new method of featuring content that most resembles the default landing page is the ability to pin posts to the top of the page. Designing posts for the purpose of being pinned will be a strategy you’ll begin to see used often. Additionally, some of the icons on your page may need to be re-sized or redesigned to fit into the new page structure. As you repurpose, restructure, or even throw out your old designs, it’s important to keep in mind these different aspects of the Timeline layout that give you the opportunity to create traction with fans. The best way to make sure your branding and design for the new Timeline layout is aligned with best practices is not to think of your Facebook Business Page as a place for static content to reside. Instead think of it as a launch pad where posts are viewed then shared. The social aspects of sharing help generate greater visibility, and encouraging that behavior is at a premium. It is even more important than how long someone views your page. Being conversational, interesting and stimulating to your target audience will achieve greater brand awareness and ultimately more sales. To get your customers to interact with your content, it should be more about them than about you. Videos are commonly shared items on Facebook, and creating engaging videos your fans can share with their friends will help broaden your reach. The influence friends have in their trusted networks is huge so making your fans feel compelled to share exclusive deals with their friends can help increase sales. Limiting deals or offers can help customers share only with those they trust and therefore they will be incited to share only with those to whom they can make a strong recommendation. Once your content is resinating with your customers they practically sell your product or service for you, and that’s great news! Archway Internet Marketing Inc. is a Chicago based company known for serving small businesses with social media, design, strategy and content to help bring new customers through the door. We pride ourselves on being available to our clients to play a crucial role in their marketing decisions. If there is anything we can help you with, please schedule an appointment by calling 1-877-50-TWEET.